In recent years, obesity has become a leading cause of infertility in women planning to expand their family. 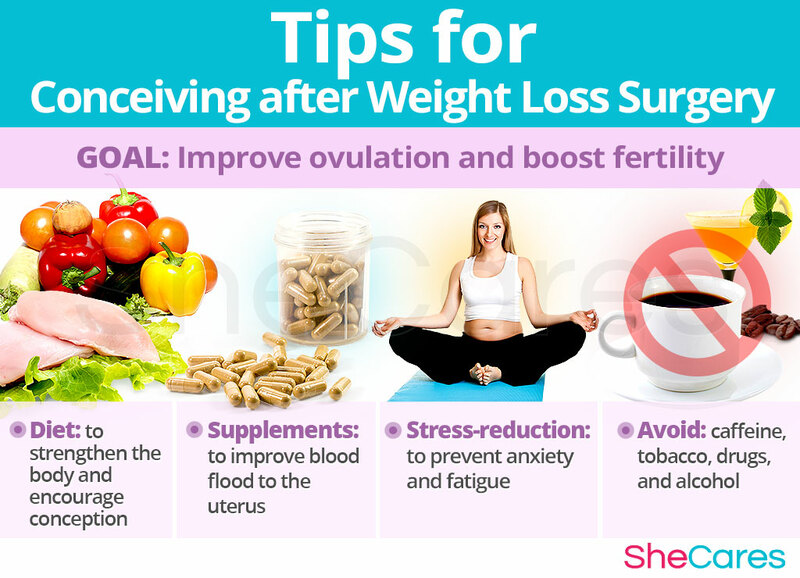 Among various treatment options, such as diet, exercise, or medications, a weight loss surgery has been shown the most effective approach to removing excess weight and restoring women's chances of getting pregnant. Continue reading to learn more about the effects of gastric bypass on your fertility and the necessary steps you should take to improve the outcomes of your surgery. Weight loss surgery, also called bariatric surgery, is designed to help women lose weight by making changes in their digestive tract. It is only performed on women whose BMI is above 40kg/m2, or women with a BMI of 35 who also suffer from other health problems, like heart disease, sleep apnea, or diabetes. Each of these surgeries offers different benefits, disadvantages, and weight loss rates. The choice between the different types depends on a woman's individual medical needs. Moreover, studies have shown that bypass surgery, gastric sleeve, or other weight loss surgeries can be beneficial for women suffering from polycystic ovary syndrome (PCOS) by increasing their chances of conception. On the other hand, since women are advised against getting pregnant immediately after the surgery, this delay in conception might cause fertility problems, especially among older women. Generally, a weight loss procedure might improve chronic maternal conditions, such as diabetes or hypertension, both of which are known to negatively affect a woman's health while she is expecting. The procedure has also shown to reduce the risk of pregnancy complications associated with being overweight and obese, such as preeclampsia or gestational diabetes. It comes, however, with certain risks of gastrointestinal issues, such as internal hernias, bowel obstructions, or dumping syndrome. Following bariatric surgery, most women do not have problems with getting pregnant and go on to have safe and healthy pregnancies. However, they have a number of considerations to keep in mind before conceiving. 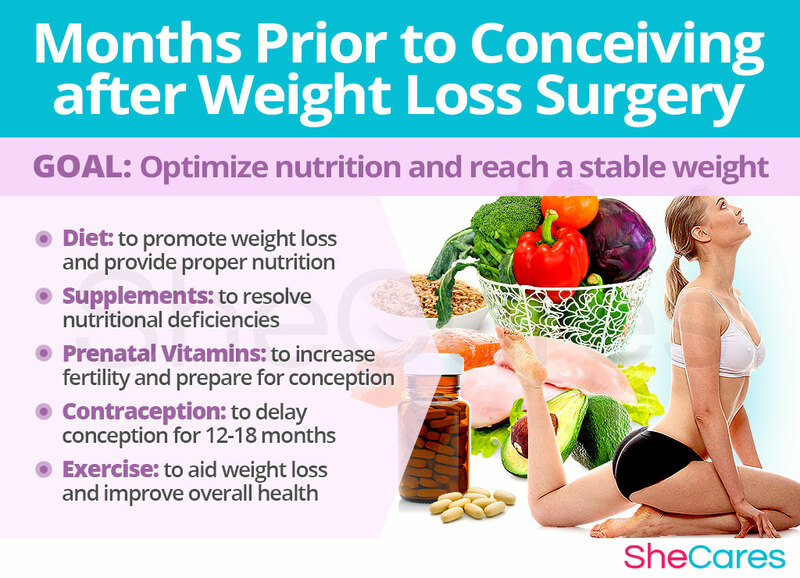 Your goal before getting pregnant is to optimize your nutrition and reach a stable weight. The months between your surgery and conception can greatly affect the progression of your pregnancy. So, it is worth taking the time to meet your goals as recommended by your doctor. 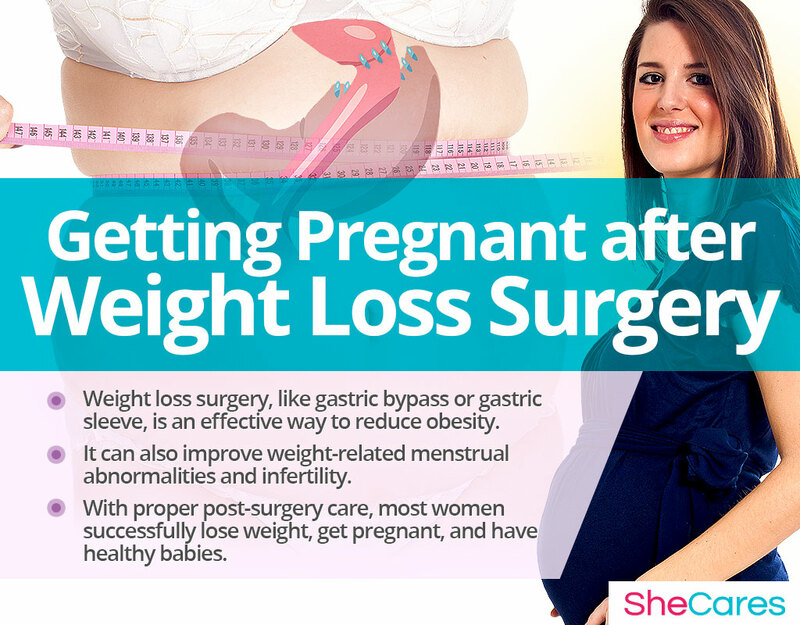 After bariatric surgery, you will be advised to delay getting pregnant for at least 12 to 18 months. This is because you will be losing the majority of your excess weight in the first 18 months after the procedure, which increases the risk of developing certain nutritional deficiencies that might prohibit you from sustaining a pregnancy. During those months, as you continue losing weight, you will have to undergo frequent blood tests to monitor vitamin and mineral levels. A healthy diet, supplements, and other good habits will help you prevent complications. Post-surgery weight loss puts women at risk for nutritional deficiencies because their calorie intake is greatly reduced, often ranging between 500-600 calories a day, and nutrients' absorption is altered. Consult with a licensed nutritionist to help you prepare a meal plan that suits your individual dietary needs. He or she will also help you develop new, healthy eating habits. Your diet will change in the weeks following your surgery, slowly moving from liquid to solids foods. To resolve potential nutritional deficiencies and prepare women for conception, you could be prescribed various supplements. They might also include standard prenatal vitamins, which have been found to decrease the risk of birth defects and complications. Hormone-regulating supplements, such as Macafem, might also be helpful in resolving hormonal imbalances, thus improving your menstruation and fertility. Contraception. After a bariatric surgery, your fertility might rapidly improve. Although it is a desired effect, you should consider contraception to prevent getting pregnant too soon. Keep in mind that since oral contraceptives might not be properly absorbed by the body, their effectiveness might be compromised. Doctor's check-ups. Losing a significant amount of weight in a relatively short period of time evokes a number of changes in your body. During the first 12 months after your procedure, you will be closely monitored by an OBGYN. Start slowly and aim to exercise for 150 minutes, 5 days a week. Focus on moderate-level, body-strengthening or cardio exercises, such as yoga, swimming, or brisk walking. Avoid strenuous physical activity as it might inhibit your fertility. If you have excess skin after your surgery, wear loose and breathable clothing while your exercise and keep up with good hygiene. Once your weight stabilizes and you do not show signs of nutritional deficiencies, you will be able to start your conception efforts. Remember that sometimes it takes several ovulation cycles for couples to succeed. Practice stress-relief techniques, such as breathing exercises or meditation. Surround yourself with people you can lean on for emotional support. Stay well hydrated as it improves cervical mucus and makes it more sperm-friendly. Avoid excess caffeine as well as smoking, alcohol, and drugs. As your pregnancy progresses, you will gain weight. It is normal and desirable in order to sustain the growing baby. However, it can become an issue for some women who had a weight loss surgery and now struggle with their body image. Continue working with your nutritionist to create a meal plan that will allow you to gain weight slowly and within the recommended range. Seeking the help of a licensed mental professional might also be beneficial. It is important to mention that although pregnancy planning after undergoing weight loss surgery is highly recommended, women who conceive sooner can still have safe pregnancies and healthy children. 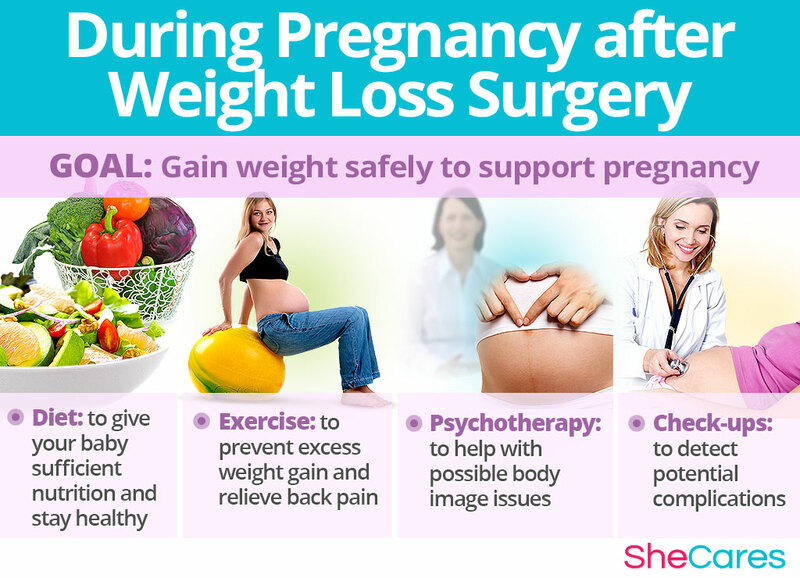 If you feel a weight loss surgery is not for you, check out how to prepare yourself for getting pregnant with obesity. Whichever path you take, remember that all pre-conception efforts to reach an ideal weight with diet, supplements like Macafem, and exercise will pay off once you give birth to a healthy baby without compromising your own well-being.